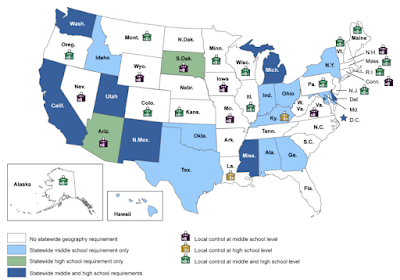 Last week the Government Accountability Office (GAO) published a report titled K-12 EDUCATION: Most Eighth Grade Students Are Not Proficient in Geography (pdf). I read it this weekend. Here's a recap. The Senate asked the GAO to report on the status of geography education and challenges elementary and secondary schools face in providing that education with limited resources. How did the GAO do the work? interviewed agency officials, researchers and "national groups in K-12 geography education and K-12 education" including National Geographic Society, Association of American Geographers, National Council for Geographic Education, American Geographic Society, National Council for Social Studies, National Science Teachers Association, Council of Chief State School Officers, Grosvenor Center for Geographic Education, RAND, and ESRI [sic]. More than half of eighth graders are not proficient in geography and there's been no improvement since 1994. More than half of eighth graders spend 10 percent or less of their social studies time (where geography typically falls) on the subject. The Department of Education (Education) assesses student achievement in geography but not as often as other topics, which it is required by law to assess. Education reports findings back to the American people; it does not have funding to better drive or assess geography education. The GAO collected data that will not surprise anyone involved in geography or GIS education. Since the report carries the GAO name, the report might carry some extra weight. I was frustrated that efforts from the National Science Foundation funded research from 2013 got little little publicity, nor discussion, even from the organizations that did the work! I found exactly seven Google News items on the report on Sunday Oct 25. The AAG's content was only picked up because Directions Magazine (where I used to work) ran the organization's press release. Over on LinkedIn Zach Dulli, the CEO of NCGE, cited bits of the report with the title, New GAO study, makes yet another case for why we need geography in every US school. I do not think the report makes that case at all; that's in part why I wrote this recap! Dulli's post was shared by an Esri employee to a LinkedIn group focusing on its Location Advantage MOOC. Perhaps more coverage and comment is coming; please let me know if you see any. The GAO did not offer any recommendations based on its findings in the report. Will any organization step up and make some recommendations regarding how to raise proficiency, teach geography more and better or change the role of the Education in regard to geography education? So far, only the AAG connected the report to its work. Its comments on the report point to the AAG Resolution Supporting K-12 Geography Education which underlies support for TGIF (last update to website: 2012) and reauthorization of the Elementary and Secondary Education Act. I hope to heard from the organizations involved in the GAO research effort (listed above). In addition, among the 10 K- 12 teachers we interviewed, seven reported they do not have time to search for better lessons and materials in geography, although they acknowledged that there are many resources and materials available online at low or no cost. How can educators help other educators find the best geography education materials? I'm as guilty of as anyone of sharing educational resources without any sort of evaluation. Should we use tools like Graphite? Of the 146 products tagged "geography" most are memorization type apps. Even key education stakeholders such as teachers, principals, and parents mistakenly think geography education involves fact-based memorization, according to officials we interviewed from three of our selected national geography organizations. I hoped that with so much extra outreach on geography and GIS in recent years these key stakeholders would have graduated from their own experience of geography education ("capes and bays") to a more modern understanding (tools to understand and impact our world). Alas, that's not the case. Is it time that we take Geography Awareness Week/GIS Day/ local GIS/geography conferences and focus not on students or the public, but on educating our education stakeholders? What could/would/should that look like?